The decision making body of the Anglican Church of PNG (ACPNG), known as the Provincial Council has just elected a new Archbishop of the Anglican Church of Papua New Guinea. The election took place at the Provincial Council Meeting which was held in Port Moresby on 11th June 2010. The new Archbishop is the Rt. Reverend Joseph Kopapa who is the Bishop of Popondetta Diocese. The ACPNG has five (5) Diocese and the Bishops from these Dioceses who are also members of the House of Bishops of the Province of PNG are eligible for election. 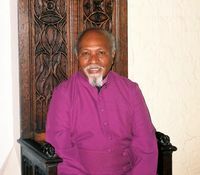 The Archbishop who is also the Primate of the Anglican Church of PNG is vested with powers within the Provincial Constitution and Canons of 2001 to be the general authority, leader and steward of the Province of PNG. Amongst his duties, the Archbishop presides over the Provincial Council and House of Bishops. The Archbishop also plays the key representative of the Anglican Province of PNG in dealing with global Anglican Communion issues whose head is the Archbishop of Canterbury. Archbishop Kopapa comes from Tufi District in Oro Province and is the fifth Archbishop since the Church’s independence from the Province of Australia. Archbishop Kopapa succeeds the former Primate Bishop James Ayong who retired in 2009.